Black Babies "Exempt" from Ohio's Heartbeat Law?? 89,668 people have visited this page. 4 have visited this page today. HOT TOPIC: Diane Moriarty on All Our Children, playing now at the Sheen Center! 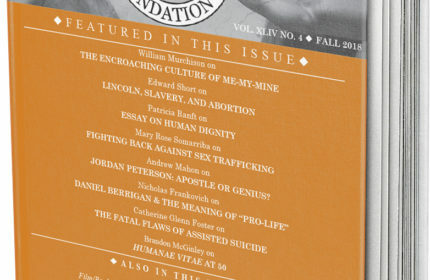 The Human Life Review is the only publication of its kind in the world: a journal devoted to life issues, primarily abortion (William F. Buckley once praised it as "the focus of civilized discussion of the abortion issue"), but also "neonaticide," genetic engineering, cloning, and fetal tissue experimentation, as well as the end-of-life issues of euthanasia, assisted suicide and suicide. We also publish articles dealing with more general questions of family and society: what the "abortion mentality" has done to our culture; how moral relativism has pervaded our political process as well as our educational system; and how the debates over day care and the children's rights movements, as well as the controversy over health care and end-of-life decision making, reflect a society sharply divided on the most basic moral questions. Our publication aims to facilitate the discussion about issues related to the Right to Life movement. We give proponents access to academic journals and legal opinions from many contributors who are highly respected around the country. We make sure our readers are properly educated and are able to operate an educated discussion about the life issues, most notably abortion. The Human Life Review is the only publication of its kind in the world: a journal completely devoted to life issues, primarily abortion , but also "neonaticide," genetic engineering, cloning, and fetal tissue experimentation, as well as the end-of-life issues of euthanasia, assisted suicide and suicide. "The focus of civilized discussion of the abortion issue"